They took a surface picture of Betelguese, only just, a couple of hours ago! 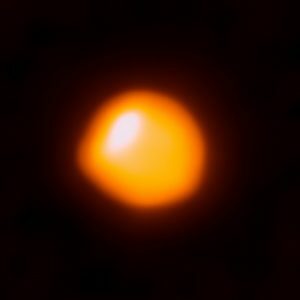 Betelgeuse is close, only about 600 light-years away in the constellation of Orion. It is one of the largest stars known, a red super-giant with a radius around 1400 times larger than the Sun’s. It’s also pretty young, just about eight million years old, and it won’t last much longer, heading for a supernova pretty soon. When that happens, the resulting explosion will be visible from Earth, even in broad daylight. I hope I’m around long enough to see it, but then again “short” for stars and “long” for humans rarely overlap. Though they must, sometimes. What a world to be alive in!